THE quest for the top prize in the Portsmouth League is following a familiar pattern with Craneswater A holding all the trump cards, writes Graham Simper. For the defending top-flight champions it is looking good to repeat their success. They are just too consistent against any new pretenders. Andy Boulton’s boys beat their R side 10-2 to stretch their lead. Stu Calver, Pedro Ferguson, who made 55, and Rob Kirby were all on song. Mark Donnely made a 45 for the losers. Waterlooville A are 13 ponts adrift despite a 9-3 return against Portchester X.
James Budd, Jamie Wilson, Nigel Ward and Emma Bonney were all on target after Mark Kingswell had given the Castlemen early hope. Ian Carter fired a 38 break and Mark Jones did well for Craneswater Z but Emsworth still chalked up an 8-4 win. Gavin Mengham, Greg Harding, Tommy O’Neil and skipper Chris Hardyman restored order. Copnor A beat Cowplain Z. Mick Hall, Dan Compton and Ant Lacey starred after a double by Rob Firby. 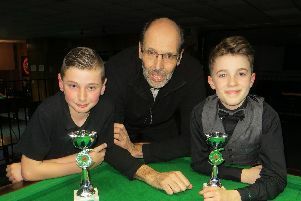 Pete Ferguson could not save Leigh Park from a 9-3 home loss to Bellair A.
Tony May and Greg Jones won early on before Lee Harding and Phil Skinner won the last four racks. Division two leaders Post Office beat Copnor E 9-3 without their star potters. Kev Harding gave them the lead but John Oldfield hit back. Then a trio of Tom Sproates, Andy White and Steve Peckham won the next six. Craneswater Q seemed to be heading for a maximum against Waterlooville Allstars. Graham Tregardine and James Gray won the first four. Another six followed through Matt Small Lee Paice and Tony Lee. Pascal Richard soon demolished hopes of a whitewash with visits of 59 and 46 to beat Leon Kelley to make it 10-2. Waterlooville C had to settle for a share of the points against Copnor D.
Phil Watson, Andy Pycroft and Gary Wilton all bagged a brace. However, Wayne Rendle, Dave Glover and Steve Green had other ideas. Copnor Xcels and Emsworth Originals also drew. Tony Horten won the first two and Paul Merrett the last. Cowplain Gas looked in trouble when Paul Chivers and Jon Challacombe scored for Pompey Royals. Paul Chivers and Gary Swatton saved the hosts. Al’s Club beat North End Bowls 8-4 at Portchester. Andy Howell, Gary Linter, James Farrell and Trevor Sanders dominated. Broadoak cruised to a 9-3 triumph over Leigh Park, while Waterlooville B saw off Cowplain Misfits. Craneswater Dandy saw off Waterlooville D 7-5, while Alexandra Bowls lost out 7-5 to Cowplain B.